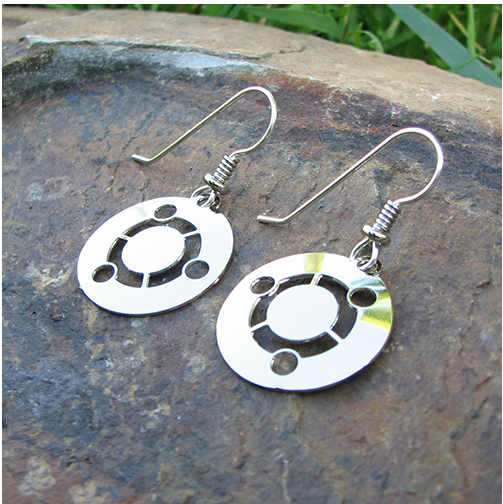 The Ubuntu earrings from Boutique Academia are quite popular! In only three months between September and December, these beautiful earrings generated $174.00 in donations to Partimus from sales of the earrings from Boutique Academia. It is great to see that these earrings have such staying power. We first blogged about these earrings on June 13, 2011. We then announced on August 4, 2011, that we were adding silver-colored earrings, as our first offerings were in gold. These earrings are nice on so many levels. They represent the Ubuntu logo, which symbolizes the family of humanity arm in arm. Of course, Ubuntu means “humanity unto others”, so this is a great symbol of international peace to be circulating. Ubuntu is one of the more popular GNU-Linux distributions, a really power operating system that is free as in free speech and free as in free beer. Most of our Partimus.org computers run on Ubuntu. The earrings are made by a woman-run business, Boutigue Academia, which is run by one of the Partimus co-founders, Maile Urbancic. And $6.00 of each earring sale are passed along to Partimus! Also, with each purchase, people are making a subtle commitment in their hearts and their minds to the concepts of freedom that underly the Ubuntu logo. Branding can be a powerful thing, when it is used properly, and for a truly good cause like peace, digital freedom, and public education. There is a lot to get excited about here. Please spread the word about these great earrings! And here is an image of the $174 check from Boutique Academia. Thanks again, Maile! This was written by Christian Einfeldt. Posted on Wednesday, January 11, 2012, at 6:02 am. Filed under News. Tagged Boutique Academia, earrings, fundraiser, Maile Urbancic, Ubuntu. Bookmark the permalink. Follow comments here with the RSS feed. Post a comment or leave a trackback.